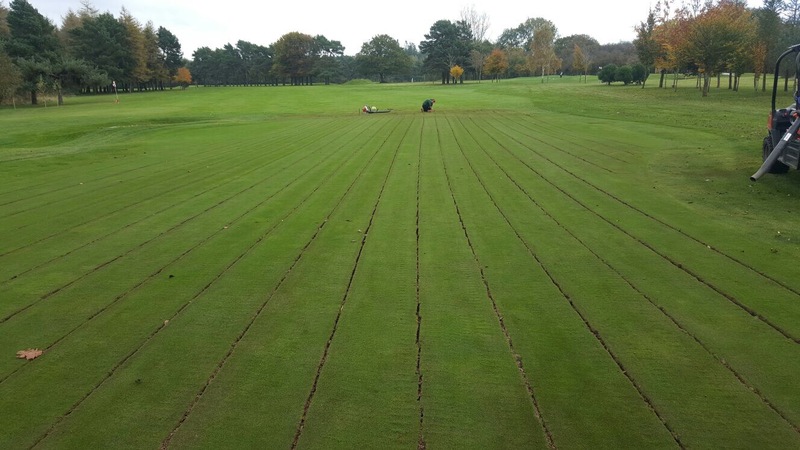 Bristol and Clifton Golf Club awarded ‘England Golf Championship Venue’ status after Greens Drainage Investment. The historic Bristol and Clifton Golf Club turned to specialist drainage firm Shelton Sportsturf Drainage to solve the problem of waterlogged greens ahead of their 125th anniversary year in 2016. The club’s Greens Chairman Carey Ashworth said: “Prior to 2015 we played on temporary greens every winter as, unlike our fairways which are built on naturally draining stone, our greens were built on clay and were simply far too wet to allow play in the wetter months. We had two very important events for the club in the summer of 2016 – our 125th anniversary which was to be celebrated with a summer festival and also the English Ladies Amateur Open Strokeplay Championship, so we were under pressure to ensure that the course was in perfect condition. We considered complete reconstruction of the greens, but with cost and recovery time being a limiting factor we decided against it. On the advice of our agronomist David Stansfield we researched specialist drainage. 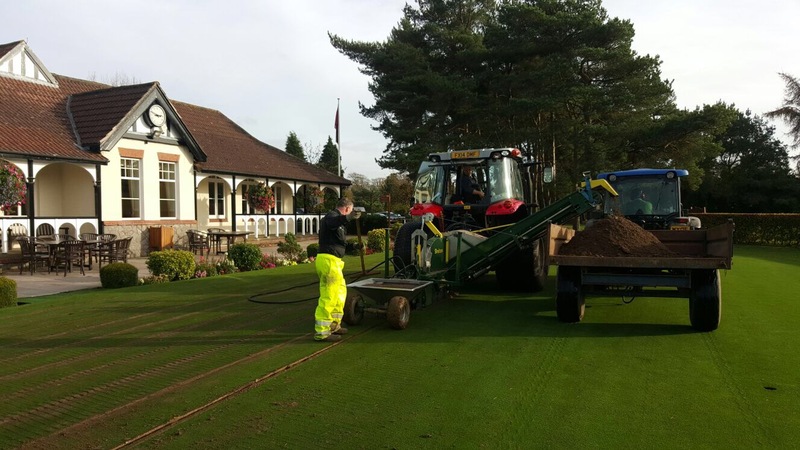 Our Head Greenkeeper Matt Hawker met Mick Claxton from Shelton Sportsturf Drainage at the BTME in 2015 and was impressed with the results they had achieved with their machinery in a short period of time and with little disruption. So, we made the decision to implement a drainage program on 9 of our wettest greens in the Autumn of that year. Mick recommended that we use their Lightning Drain System and backfill the trenches with Sportag which has a hydraulic conductivity 10 times that of gravel, this would enable a faster flow of water away from the surface for optimum results. Shelton supplied the machinery in the form of a tractor, System 25 Trencher and an operator. We started work in the Autumn of 2015, installing 25mm perforated land drainage pipes in 35mm wide trenches backfilled with Sportag in a one pass operation. The pipes were installed at 500mm centres to give us a really efficient drainage system. The greens recovered very well, they remained playable throughout the winter recovery period and the drainage worked brilliantly. In fact, the greens which had been Lightning Drained, which had previously been the worst on the course, remained open all winter when all the other greens were on temporaries. By the time we welcomed the English Ladies for the Strokeplay championship the greens were in top condition, rolling and playing very well. We were extremely happy to hear the players tell us how impressed they were with the greens and also to be awarded ‘Championship Venue’ status by English Golf. 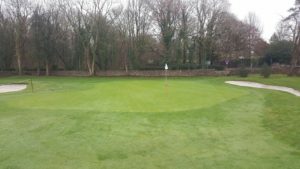 In June 2017, we commissioned an independent report from David Stansfield who reported that in the last 6 months thatch levels on the drained greens had reduced by 20% without any mechanical intervention, scarifying or hollow coring, whereas thatch levels on the undrained greens had increased by 10%. The maintenance has been no different, we haven’t had to implement any special treatment or change our routines, yet the greens now drain well and are healthier and less prone to disease. Our members have noticed the difference in play, the improvement in firmness, dryness and true roll and one of our neighbouring clubs has also planned in a scheme of drainage works after seeing the results of ours. We have plans to drain a further 5 greens next year and the remaining 5 at some point after that. I would certainly encourage anyone who may be considering reconstruction to improve their greens drainage to look at the Shelton system first. You may be able to save yourself a lot of time and money”. 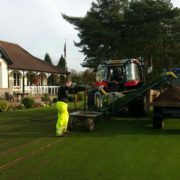 To find more about how your sportsturf can benefit from a good drainage system, visit sheltonsdrainage.com or call 01507 578288.